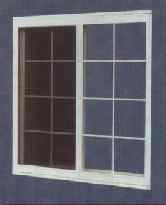 The Columbia Series 3700 Sliding (Rolling) Aluminum Pole Barn Windows with J-Channel is designed for use in post frame building construction or in standard single dwelling or multi-family units. General: The Columbia Series 3700 aluminum pole barn window HS-R20 shall comply and bear the quality certification label in accordance with the ANSI/AAMA Certification Program 101/85. Glazing: All aluminum pole barn windows shall be glazed with clear ½” dual insulated glass, set in a butyal tape and secured with vinyl glazing bead (inside glaze). Also available bronze tinted glass muntin bars between the glass at an extra cost. The insulated glass shall be manufactured under the trade name “thermo cell” and shall meet or exceed ASTM E 773-83 and ASTM E 774-84A Class A.